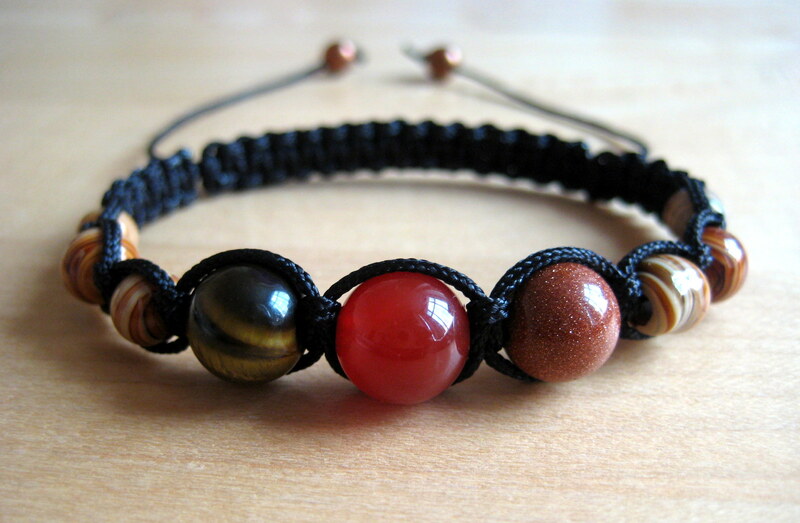 I had a really good response to this post on some shamballa bracelets I made. So I thought I would do a how to post to show how they are made. Check you can thread the beads onto the thin thread before you begin! 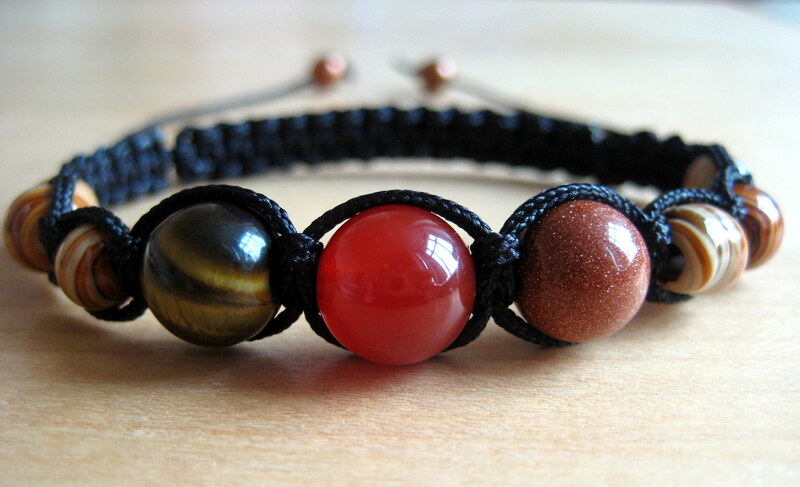 The bracelet is made by tying a series of “square” knots around the central thread. To begin, tie a knot at the end of the short, thin thread around a safety pin and pin it to something like a cushion to hold it in place. This is the central thread. Then slide the 1m thread underneath with the same amount of thread on each side. Thread 1 starts on the left hand side and thread 2 on the right. Pass thread 1 over the central thread. Pass thread 2 over thread 1, then under the central thread. Step 1: tying the first part of the square knot. Now pass thread 2 up through the loop left by thread 1 on the left hand side (thread 2 goes under then over thread 1). Pull to tighten. Now thread one is on the right hand side and thread 2 on the left. Pass thread 1 over the central thread. Pass thread 2 over thread 1, then under the central thread. Now pass thread 2 up through the loop left by thread 1 on the right hand side (thread 2 under then over thread 1). 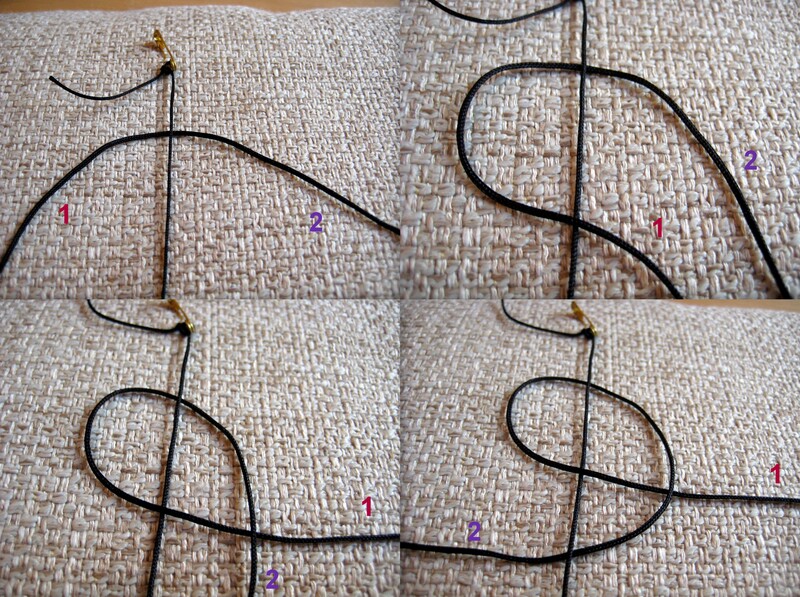 Tie 4 more square knots (or more if you want a larger bracelet) following the same process. 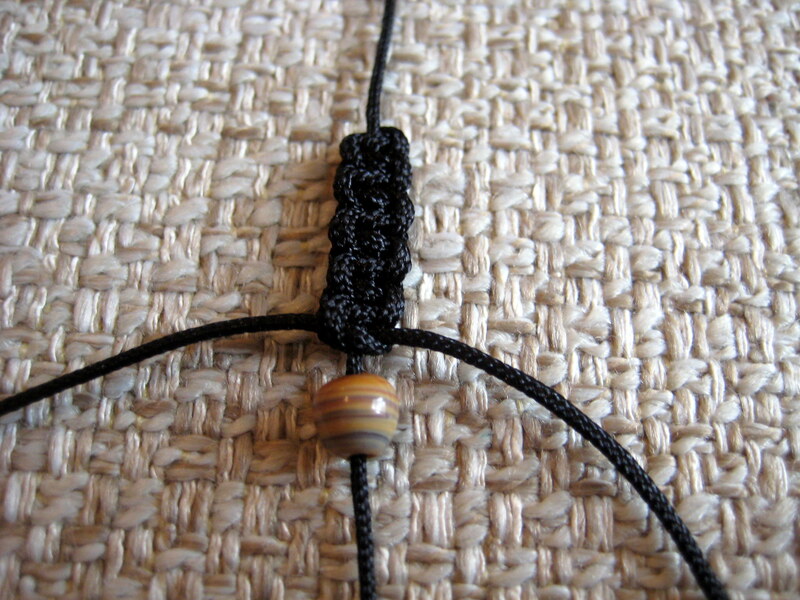 Slide a bead up onto the central thread and up to the last knot. 5 knots done and first bead inserted! Now tie a square knot to secure the bead in place. 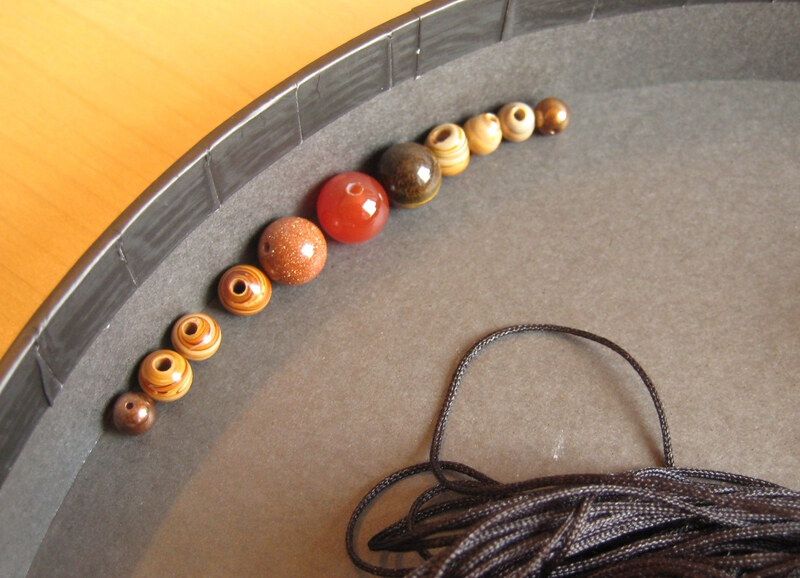 Slide on the next bead, tie a knot, and so on until all your beads are secured on the bracelet. Finish by tying 4 knots (or however many you need to make the sides even). Pull the thread very tight on the last knot, and cut the thicker threads 3mm from the knot.Secure the last knot by melting the 3mm ends of the thread using a lighter or match. Careful here! Use glue if you prefer. Now the main section of the bracelet is finished, untie the top knot at the safety pin. At this point you can slide the work down the central thread to make sure it is central on the thin thread if needed. To make the fastening, lie both ends of the thin thread across each other as shown in the photo. 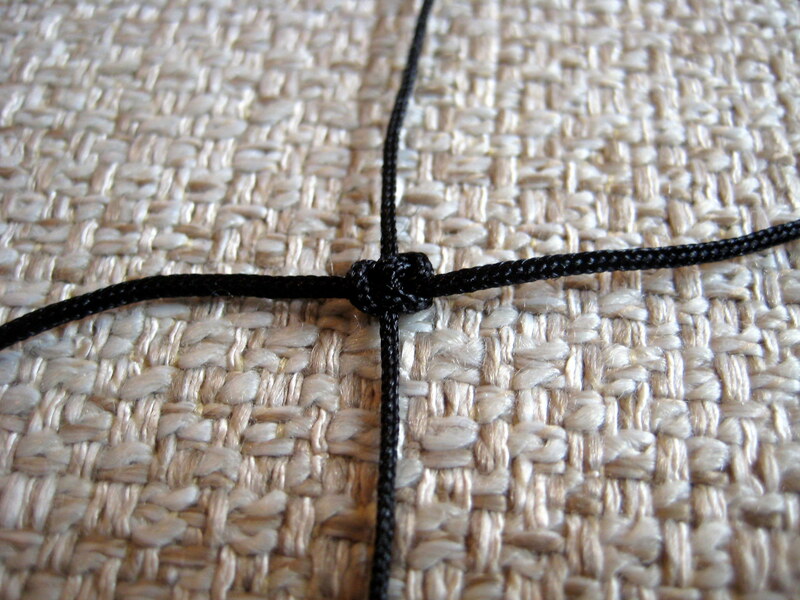 Slide the 60cm piece of thread underneath the two threads and tie a square knot as described before. Keep tying knots (you will need around 10) until the fastening can be closed around the wrist without showing the central threads. 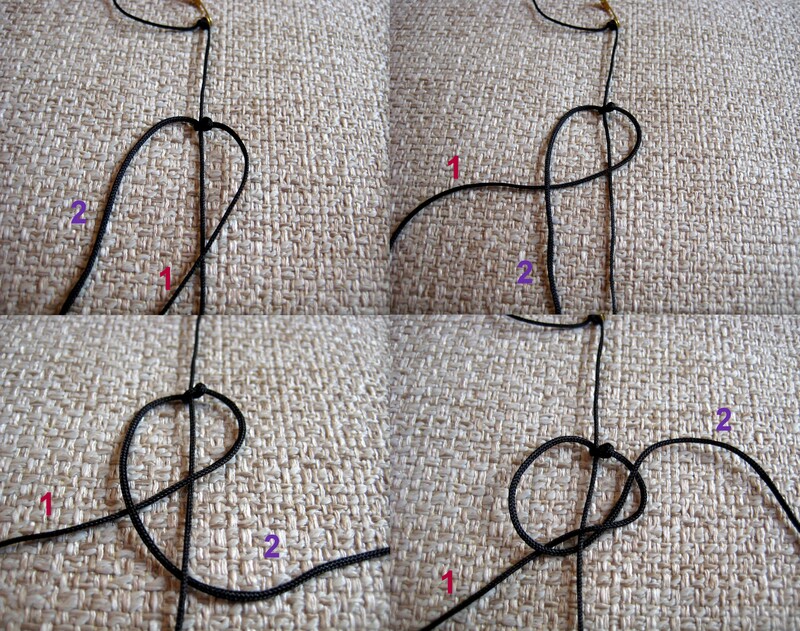 Finish the last knot by melting the ends as before. 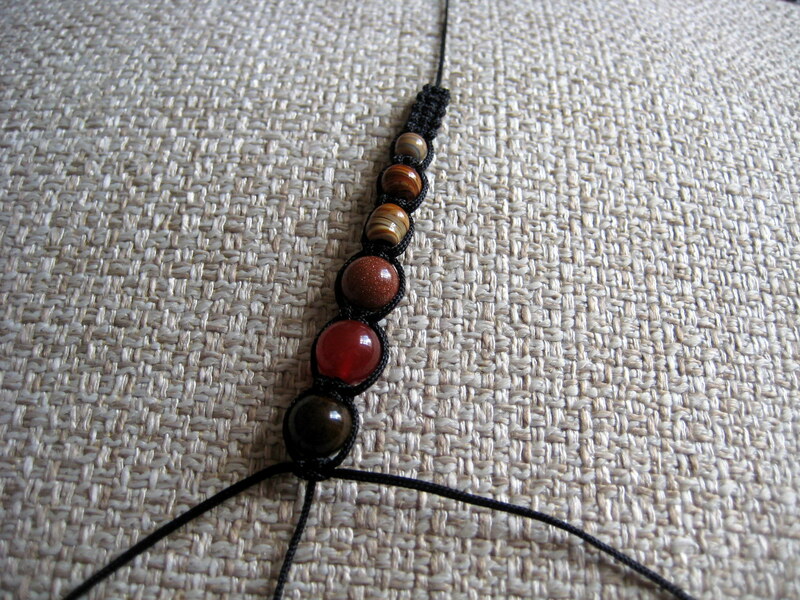 Now slide a small bead onto each of the loose ends and knot the threads to secure them. Melt the very ends of the threads to prevent fraying. You did a great job at showing how to do the knots :) I wanna make one! I love the different beads in this one!